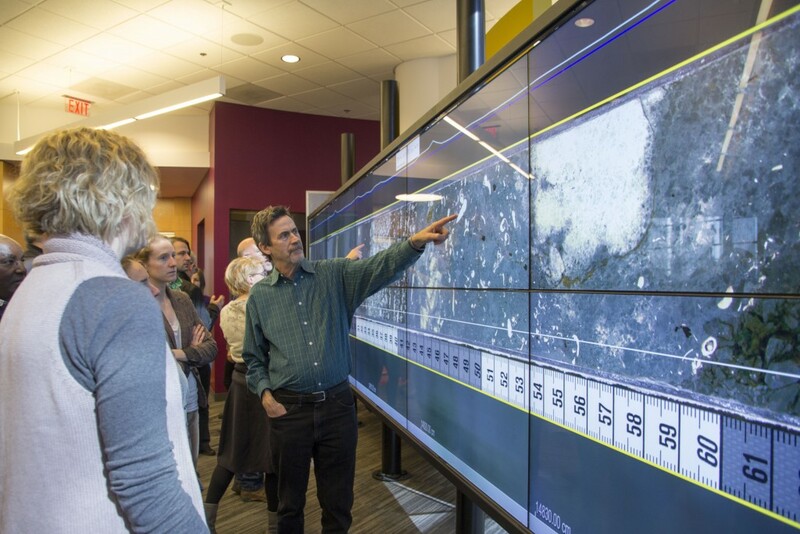 Georgia State University recently hosted a conference for researchers from the Hominin Sites and Paleolakes Drilling Project (HSPDP), in collaboration with the Smithsonian Institution’s Human Origins Program. 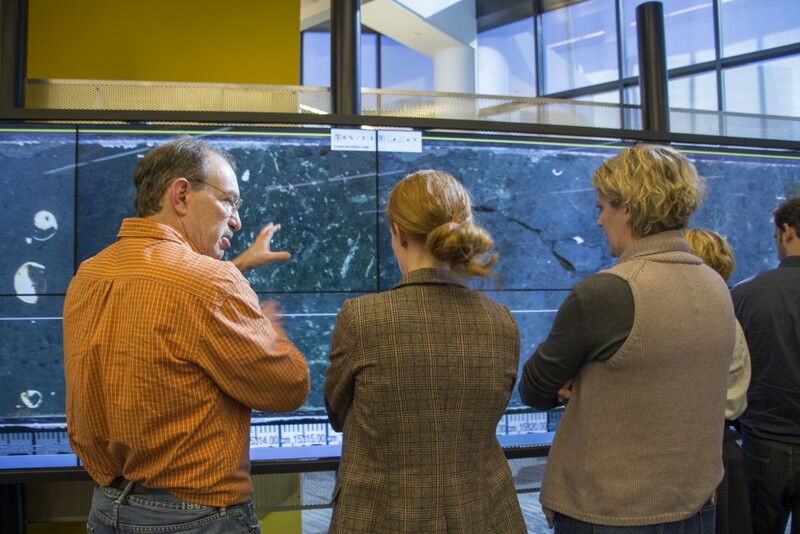 The HSPDP consists of five research teams from 12 countries, plus the Smithsonian Research team that is collaborating with HSPDP. GSU’s own Dr. Dan Deocampo directs the lab which analyzes the mineral samples from 5 of 6 core sites using X-ray diffraction techniques. To help visualize scanned core images, project team members worked with the CoreWall team, a group of scientific software developers who support researchers viewing images stitched together as seamless image files. 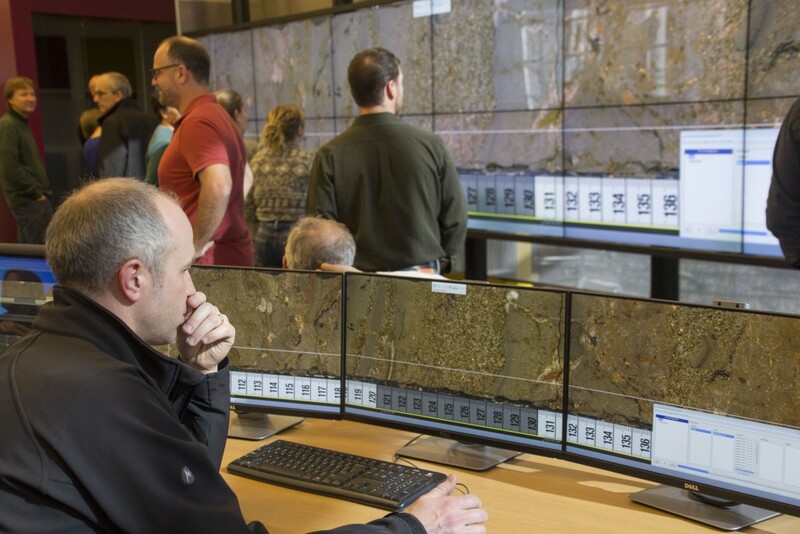 With the cores ranging from 300 to 600 meters in length, visualizing these core images on a large digital canvas enhances the teams’ analytical capabilities. 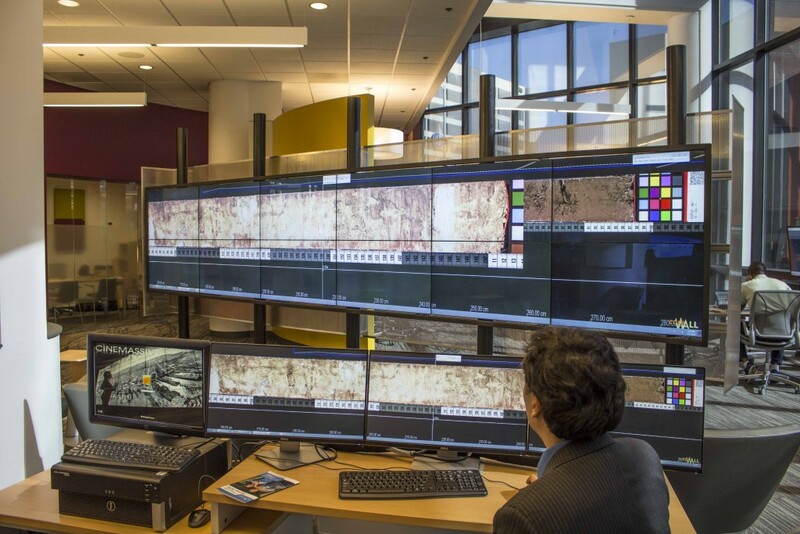 The 24 foot (7.3 meters wide) interactWall at Georgia State University Library’s CURVE provided the perfect digital canvas for the six research teams. 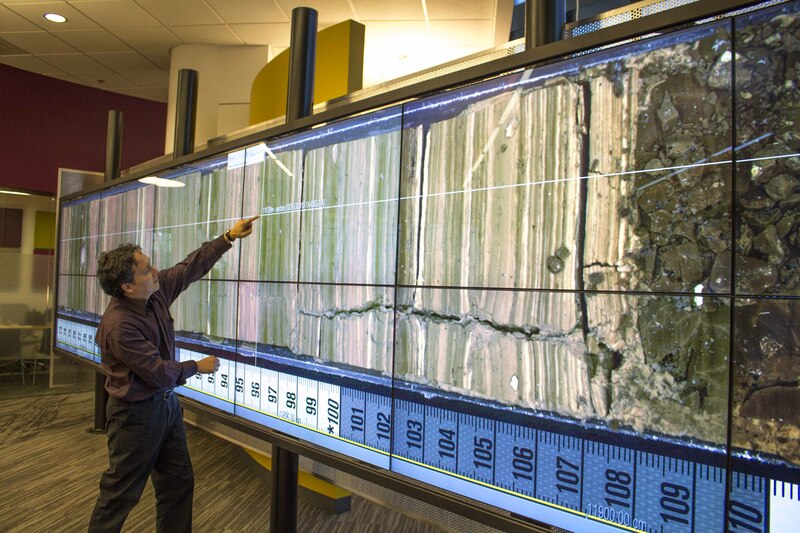 Deocampo noted of the interactWall, “This technology allows us to closely examine the sediment in detail while keeping the larger context – we’re literally looking through a window at the earth’s history millions of years ago. 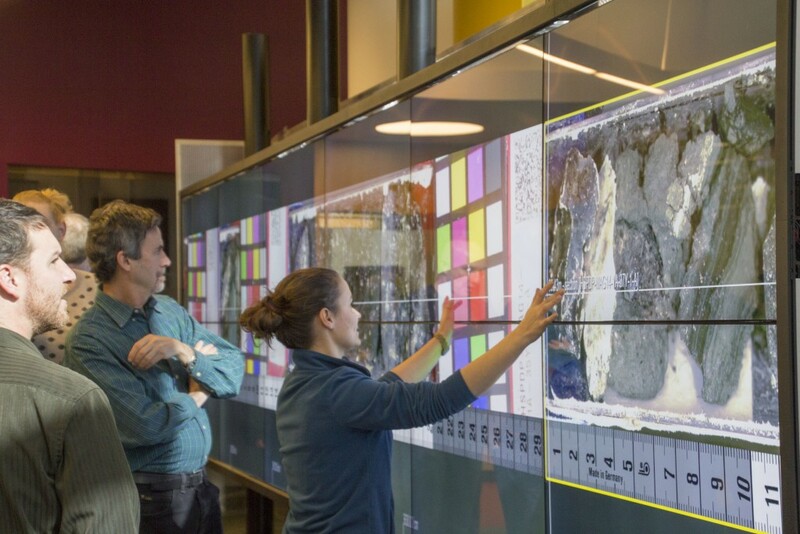 This is helping us understand how changing climate affects the environment, ecosystems, and organisms in Africa and around the globe.” The Hominin Sites and Paleolakes Drilling Project team took full advantage of the visualization capacities of the interactWall. Dr. Andy Cohen, Distinguished Professor of Geosciences at the University of Arizona, examines a core from Lake Turkana, Kenya. Dr. Jenni Scott from Mt. 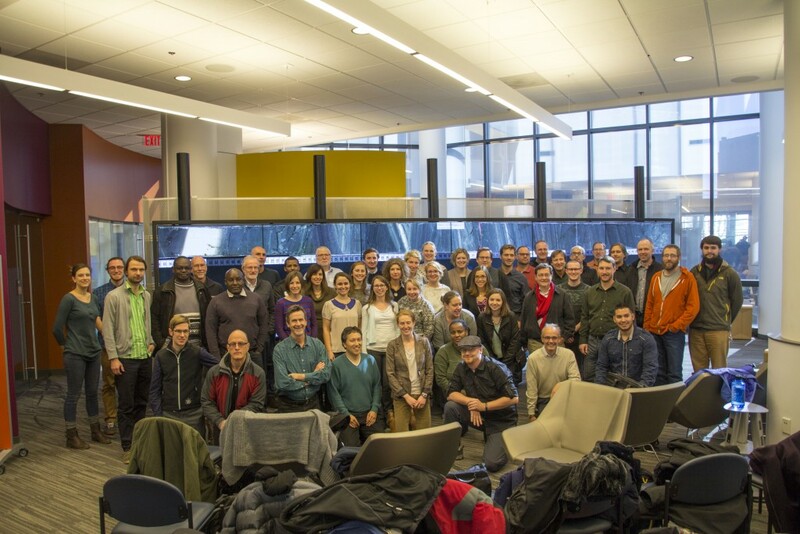 Royal University (Canada) shows Dr. René Dommain from Smithsonian Institution and Chad Yost, Ph.D. Candidate from University of Arizona the core from Olorgesailie, Kenya. Dr. Anders Noren from the National Lacustrine Core Facility at the University of Minnesota examines the core from Lake Baringo (Tugen Hills), Kenya. 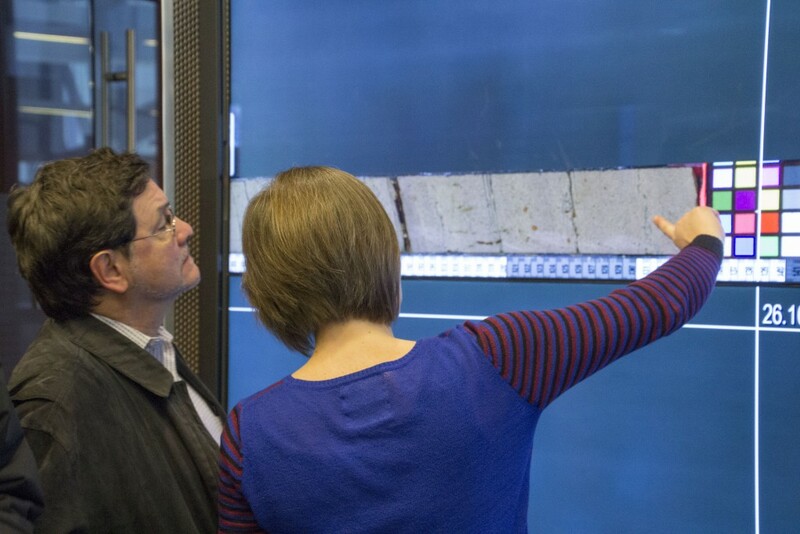 Dr. Tim Lowenstein, from the Binghamton University, discusses the Lake Turkana core with Dr. Cat Beck from Hamilton College, and Dr. Emily Beverly, a Post-Doctoral Research Scientist in the Department of Geosciences at Georgia State University. Emma McNulty, PhD candidate at Binghamton University, zooms in on an element of the core from Lake Magadi, Kenya. Dr. Jenni Scott, Mt. Royal University (Canada) discusses with Dr. Rick Potts, Director of the Human Origins Program at the Smithsonian Institution, the core from Olorgesailie, Kenya, collected by the Smithsonian and Kenyan science team. The Hominin Sites and Paleolakes Drilling Project team. 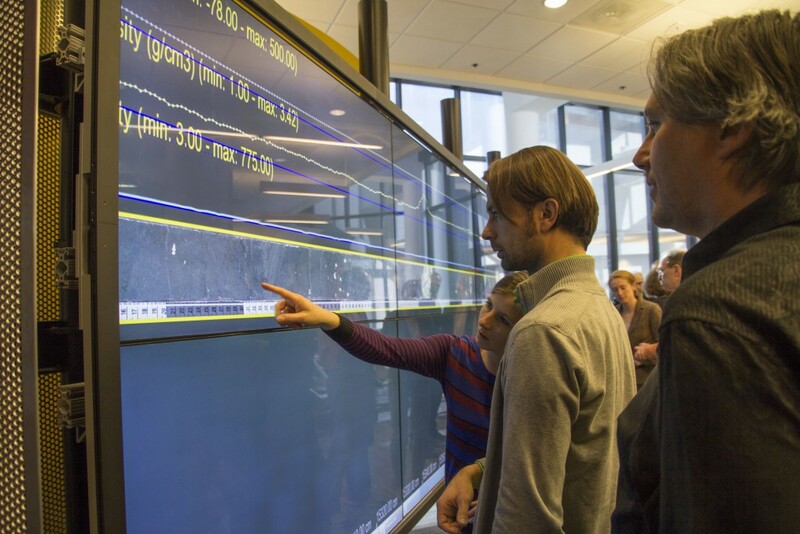 GSU team members include Dr. Dan Deocampo, Chair of the Department of Geosciences, graduate students Nate Rabideaux, Alexandra Simpson, Karim Minkara, and undergraduate students David Davis and Sanam Chaudhary. Join us on Wednesday, November 12 from 2pm to 3pm in CURVE for a World Community Grid guest lecture.